It’s the first day of Spring! Over on the East Coast, we are all very done with winter. There is one tiny snow patch in our neighborhood, and the kids and I take great pleasure in stomping it every time we pass by. I’m ready for green growing things, bright sunshine and just enough chill to wrap in a nice crocheted jacket (still on my to do list, but I’m dreaming here). Another thing I’m ready to see off is my old tired purse. We don’t need to talk about pleather — over it. 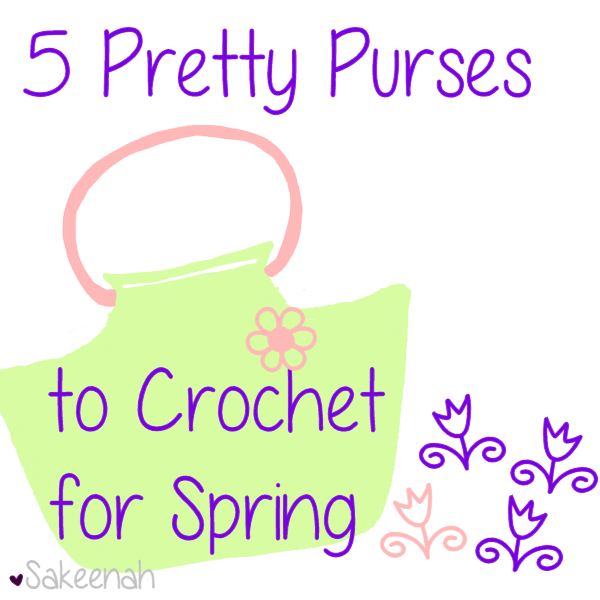 I can’t think of a better way to welcome spring than to get started on a pretty crocheted handbag. I’ve been looking at lots and have narrowed down my choices to these five. The style of the Crochet Posey Purse is the way I like purses, just slung over the shoulder. I don’t like dealing with longer straps too much. There are almost 50 completed projects on Ravelry, each looking a little different. It looks very customizable and doable. 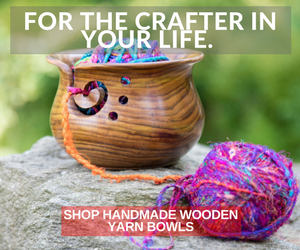 The pattern calls for 2 skeins of Red Heart Super Saver Yarn , a 3/4″ button and a set of round bamboo handles. This 7-Inch Darice 2-Piece Bamboo Handle Set is a good deal at $6.99. Most listings I have seen are only for one handle at a time. Free pattern. Wow, this African Flower Purse found on Craft Passion seems ambitious for me, but it is very pretty. I haven’t tried out African flower motifs, yet. This looks like a great project to jump into them with. The designer has a great 2-part tutorial for you to follow with tons of pictures. I really like the color combo that Joann Loh chose, but there are also some nice combos shown on the pattern’s Ravelry page. Sport weight yarn is suggested. Free pattern. The Crochet Hobo Bag has been on my list for so long. I just love it. Inspired by a Nordstrom handbag, this clever crocheter made it her own. This pattern is pretty popular. There are over 1,200 completed projects for the this pattern. The Crochet Hobo Bag pattern calls for Wool of the Andes Bulky. This one has a liner that you sew and then sew in. I have a sewing machine, but so far it’s just a big fat paperweight. Maybe this project will get me to give it a go. Free pattern. If you are weary of trying out sewing to make a crocheted purse, the Flower Burst Handbag found on Chocolate Mints in a Jar might just be the one. It looks stylish in one color, but there are some really nice variations using different colors for the top, bottom and flower band. This pattern calls for about 230 grams of worsted weight yarn. Free pattern. Check out the bright, cheery Peachy Green Purse, especially if you love popcorn stitches like I do. Also a great one if you’d like to avoid sewing. “This is a fun little purse, perfect for spring-time, or that fashion-conscious tween on your shopping/hooking list. The stitches are tight enough that there is no need for a liner, and the yarns used are all machine washable.” This pattern calls for sport weight yarn. Free Pattern. Do you plan on welcoming spring with some crochet projects? PS – You can still enter to win a free online crochet or knitting class until 3/31. Disclosure: this post contains affiliate links. See my disclosure policy for more info. Thanks for sharing these patterns. I love the first bag, very cute!